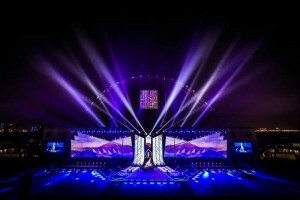 UAE – Nearly 200 Robe fixtures were used by award-winning lighting and show designer Terry Miranda of Lighthouse Productions to light a special production of musical “Fakhrak Ya Watan” (The Pride of a Nation) for the 2016 Ras al-Khaimah National Day Celebrations on the eve of the United Arab Emirates 2016 National Day event. Ras al-Khaimah (RAK) is one of the seven Emirates making up the UAE. The spectacular, performed by a cast of over 800 singers, dancers, actors and poets of all ages, was attended by His Highness Sheikh Saud Bin Saqr Al Qasimi, Supreme Council member of the UAE and ruler of Ras Al Khaimah, plus a host of dignitaries and VVIPs as well as 10,000 members of the public. The show, which included eye-catching projections mapped across a 92 metre wide set and performance area, celebrated UAE’s achievements over the last 45 years and presented a vision of the future of the country based on peace and inclusion. It culminated in a high-impact four-minute pyrotechnic and laser spectacular finale, leaving guests stunned with awe! 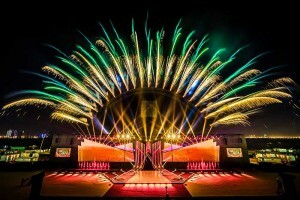 Lighthouse Productions actually designed and built the entire 1,250,000 square metre site from the ground up, creating the venue for the event from the stage and set, extensive backstage and production areas to the seating tribunes and car parks, in an empty space on the mangroves along the Ras al-Khaimah Corniche waterfront. Terry, designer of the show as well as being responsible for the lighting design, along with his team at Lighthouse Productions have designed, produced and supplied equipment and technical services for many prestigious events in the region. A project like this with a complete site build starting a month before the show date was challenging, high pressure and ‘pushed the envelope’ in every way. Thirty-two Robe MMX WashBeams were utilised, rigged all over the structure. They were used extensively for general lighting, washing the stage, for gobo and beam work onto the floor and also to complement the fireworks, the majority of which were rigged to a 72 metre wide by 44 metre arch erected behind the stage. The MMX WashBeam is one of Terry’s favourite fixtures. He loves it for its brightness, flexibility and smooth transition between wash and beam functionality. He also comments that for the Middle East region, where shows are often organised at short notice, a multi-purpose fixture like the MMX Wash Beam gives LDs multiple possibilities if they have a very compressed time-frame to get their show on! “The handle-ability of this fixture has been invaluable time and time again,” he said. There were 22 x 300E Beams on the show, 14 rigged on horizontal trusses both sides of the stage and used for punchy beam to complement the projections and the other eight on the verticals. Twelve ColorWash 575 ATs – still going strong after over ten years’ service in the dusty, arid desert environment of the UAE – provided rear and side lighting onto the dancers. One of Lighthouse’s recent purchases has been Pointes and 24 of these were used on this show, rigged on the angled trusses either side and used for a variety of aerial effects and as head-height lighting for actors entering the stage space on a mechanical boat prop. The Pointes were combined with the MMX WashBeams and some 7kW searchlights upstage on the deck to present a number of ‘beam layers’ which could be revealed and juxtaposed as the show unfolded. Terry comments that the light weight of the Pointes made them handy for rigging almost anywhere on the structure at the back, while their intensity and the quality of the optics enabled them to ‘hold their own’ against other more powerful light sources across the 40 scenes involved in the performance. Twelve PARFect 100s along the front of stage left and right were used to illuminate the various dance troupes participating in the show, with another 12 dotted around at the back. Other Robe fixtures on the rig included CycFX 8s, LEDWash 1200s and ColorMix 250s. The big creative challenges of the show for Terry and the Lighthouse Productions team were making the big bold statements needed to reinforce the show with its important cultural message, along with presenting the drama and excitement associated with a large scale spectacle. “I was extremely proud of what we delivered and also working very closely with the talented local Emiratis,” he stated. Terry has been using Robe for several years and Lighthouse Productions has been a big investor of the brand. He feels that Robe’s move to set up direct representation and distribution in the region with the foundation of Robe Middle East Trading LLC has been smart and positive, enhancing what had been an already organic growth pattern. Over 400 technical and event services staff and crew in total were involved in staging the 2016 Ras al-Khaimah National Day Celebrations so successfully, including a full time team of 30 from Lighthouse Productions. The lighting programming was completed by Adrian Guzman. The musical was directed by Mohammad Al Amri, director of the show, Ali Al Khawar, director of the music and Obaid Ali, director of the choreography. 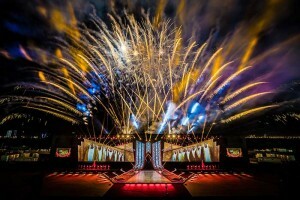 It was the largest Emirati musical production to date, created and presented by a strongly Emirati team working alongside Terry and Lighthouse Production. 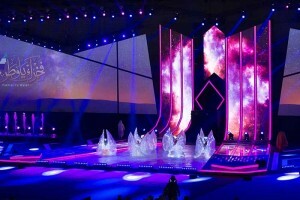 The performance included translated sub-titles for non-Arabic speaking attendees and a truly international cast of artists from India, the GCC, France, England, Morocco and the Philippines, as well as a host of leading Emirati talent.